I would really like to win any of the three prizes. My favorite though has to be the book A Garden of Shawls by Karen Whooley. I'm a big fan of Karen and was one of her test crocheters last month for her latest fabulous sock pattern. Love crochet socks! The first part came out this week but there is certainly time to join in with the giveaway deadline of May 22nd over six weeks away. It's running as a Craft Guild of America (CGOA) Spring 2017 CAL AND also in the CAL Central Crochet group so the ways to stay notified are: the Ravelry CGOA group, the Ravelry CAL Central group, the CGOA CAL Facebook Group and the CGOA blog. 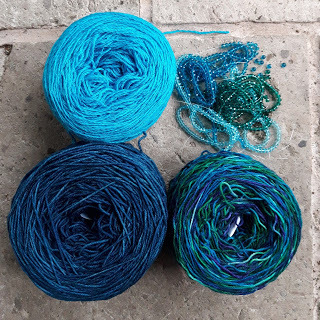 I'll personally be adding the blog to my Feedly app to keep up and using the hashtags on Instagram and Twitter #CGOACals and #calcentralcrochet to share my progress. Do let me know if you're joining in!! Thank you Mum. It's going to be beautiful especially with the beads. Thank you Pia! I've just completed the border and it's looking fantastic! Your pattern is wonderful.